You’re crazy about basketball, but even more crazy about her. With March Madness upon us and Duke Basketball throwing us win after win, we are in for one thrilling month of basketball. Diamonds Direct in Raleigh shares your excitement, but lives for the opportunity that this time of year offers couples in love. March Madness 2018 could be an epic one for you with another winning Duke Basketball season and an engagement in your books. We know all the hoopla doesn’t leave you a lot of time to shop for an engagement ring, so let us steer you toward Diamonds Direct in Raleigh, NC, our Coast Diamond Retailer of the Week, for all your Coast Diamond engagement ring needs. Did you know… You can choose any Coast Diamond engagement ring and set it with a “Duke Blue” sapphire gemstone? Or you can choose a Coast Diamond Signature Color Collection engagement ring with rings, like the one above (LS10015-S), specifically designed with one-of-a-kind precious colored gemstones. Stop her heart with this modern Coast Diamond halo engagement ring (LC5441) with a split band of diamonds. The matching wedding band is slightly curved for a snug fit. The triple-double is a sign of versatility and this Coast Diamond six-prong solitaire engagement ring (LC5250) is the queen of versatility. Wear it with the matching diamond band (WC5250) or stack it with one or more of the many Coast Diamond stackable band designs. This is the makings of an epic March Madness. Hurry into Diamonds Direct, Raleigh and find your winning Coast Diamond engagement ring. Congratulations Diamonds Direct, Raleigh for being our Coast Diamond Retailer of the Week! In this season of love, there is nothing more important than to celebrate it! Lamon Jewelers has been celebrating love for over three decades with fine southern hospitality. They have the largest inventory of estate jewelry in Knoxville, TN and a carefully curated collection of designer engagement rings and fine jewelry, of which Coast Diamond is proud to be included. With tradition at the forefront, but always keeping in mind what is fresh and current, Lamon Jewelers will help you to find the diamonds that celebrate your love. This week celebrate love and Lamon Jewelers of Knoxville, TN as our Coast Diamond Retailer of the Week. Round brilliant diamonds have been the most popular diamond shape for hundreds of years. It is the diamond shape that has the most option when considering the Four Cs as well as maximum brilliance and sparkle. Round brilliant diamonds are traditional but just as fresh and relevant when included in bridal jewelry trends of now. These Coast Diamond rings of round brilliant diamonds prove it. The Coast Diamond 1CT two-tone wedding set (LC5403RG_WC5403RG) features a round diamond halo framing the center stone in white gold. The center stone is secured with a two prong setting. Fishtail set round brilliant diamonds decorate the rose gold shoulders of the ring. This Coast Diamond band (WC5181H) is almost one-half carat of round brilliant diamonds. It is the perfect size band to accompany other diamond and gemstone bands for the much-coveted stack of rings. Congratulations to Lamon Jewelers of Knoxville, TN for being our Coast Diamond Retailer of the Week! Celebrate love! We read an article this week about Diamonds Direct that convinced us they are the place to go if you are planning to buy one of the most wonderful gifts for Valentine’s Day… a Coast Diamond engagement ring. In the small amount of time you have you need a jeweler that is quick to teach you the facts, like the Four Cs of diamond buying. You need a jeweler that knows their Coast Diamond engagement ring inventory. And most importantly, you need a jeweler that is warm and friendly, efficient and trustworthy. Diamonds Direct of Charlotte is all of these. This week we are excited to call Diamonds Direct of Charlotte, NC our Coast Diamond Retailer of the Week. Read all about the fun and informative experience a secret shopper from the CharlotteAgenda.com had at Diamonds Direct, Charlotte. The double halo engagement ring is a cost efficient way to add impact to your diamond center stone. Our Coast Diamond double halo engagement ring (LC10130) suits a 1.25CT center diamond. Fun fact: A split band holds the weight of a larger engagement ring securely on your finger. The oval halo engagement ring elongates the finger. Our Coast Diamond oval halo engagement ring (LC5410-OV) has a 7×5 (mm) oval diamond center stone. Fun fact: A one carat oval cut diamond looks larger than a one carat round cut diamond. A truly elegant halo engagement ring is decorated with delicate strands of diamonds. Our Coast Diamond halo engagement ring (LC5449) features strings of diamonds that intertwine to enhance the 1.5CT center stone. Fun fact: The matching fitted diamond band creates a unique and beautiful wedding set (pictured as our featured image). 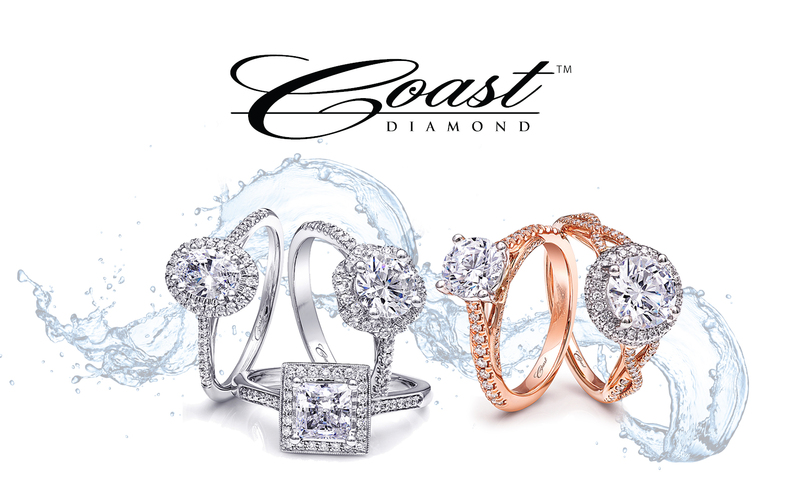 Congratulations to Diamonds Direct of Charlotte, NC for being our Coast Diamond Retailer of the Week!